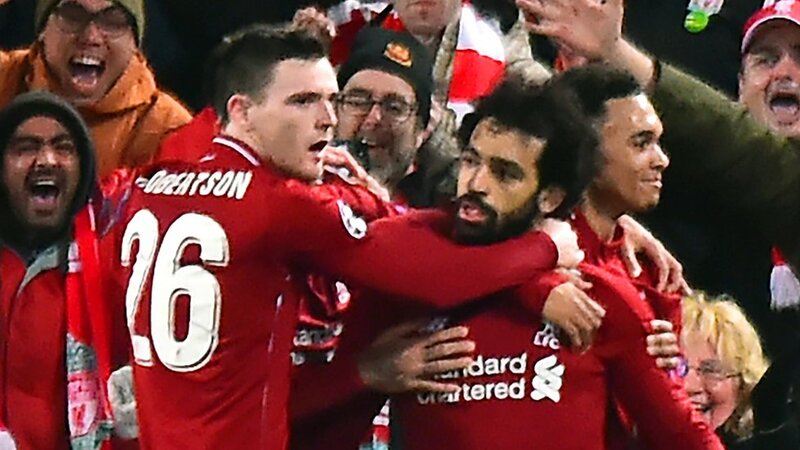 Liverpool boss Jurgen Klopp said he “could not be prouder of a team” as Mohamed Salah’s goal and Alisson’s brilliant late save earned a place in the Champions League knockout stage with victory over Napoli. The Reds needed to win with a clean sheet or by two clear goals to make the last 16 – and in-form talisman Salah obliged by beating David Ospina at his near post in the 34th minute. Liverpool fully deserved their victory as Ospina partially redeemed himself with fine saves from Salah and Sadio Mane, with the latter and Virgil van Dijk also missing clear chances to extend the home side’s advantage. The clean sheet was the key, however, and Liverpool survived a huge scare in injury time when Alisson made his crucial save from Arkadiusz Milik in a rare Napoli opening. “I have no idea how Alisson made a save like this, it was amazing,” Klopp said. “It was wild and there were lots of counter attacks but we were ready for that. That is Anfield live and in colour. Liverpool go through in second place behind Paris St-Germain – a feat achieved despite losing three away games in their group. The Reds, who were beaten by Real Madrid in last season’s final, will face one of the group winners when the last-16 draw is made on 17 December. That could lead to another meeting with the champions, while their Spanish rivals Barcelona, Klopp’s former charges Borussia Dortmund and Portuguese champions Porto have also advanced by topping their groups. Salah started the season slowly after his stellar feats when he scored 44 goals last season – but he has stepped on the throttle in recent weeks and now looks like the player who destroyed defences in domestic and European competition last season. The Egypt forward – fresh from a hat-trick in Liverpool’s 4-0 win against Bournemouth – made the difference here, admittedly with the help of a dreadful piece of goalkeeping from Ospina, and his pace, power and movement was often too much for the Italians’ defence to cope with. It was all summed up in the goal as he somehow escaped the mountainous figure of Kalidou Koulibaly to make the decisive contribution. Salah’s strike was even more significant as his fellow striker Mane, for all his tireless work, had a night in front of goal that he will not recall with pleasure. Salah in full flight, along with his capacity to score crucial goals, is a threat to any defence and his influence will only grow as Liverpool continue their challenge for the Premier League and Champions League crowns. Liverpool’s run to the Champions League final last season was characterised by a series of blistering attacking performances that simply swept away opponents. Ultimately, though, it was undone by one of the most calamitous goalkeeping performances in a major final as errors by Loris Karius ensured Liverpool lost 3-1 to Real Madrid in Kiev. Reds boss Klopp, perhaps belatedly, acted in the summer when he paid £67m to sign Brazil keeper Alisson from Roma. Alisson has already added an extra layer of security to Liverpool’s defence along with £75m centre-half Virgil van Dijk – but the big players are bought to shape the important moments, and how Alisson delivered at Anfield. Liverpool had missed a succession of chances but the only real damage to their Champions League aspirations could be inflicted by a Napoli goal and it almost arrived at a time when they would have had no chance to respond. There was an air of desperation around Anfield as Milik found himself in front of goal eight yards out, deep into four minutes of added time. But as the stadium held its breath Alisson reacted quickly, made the block and Liverpool were through. Alisson was an expensive, albeit necessary investment and that investment paid off right here. Liverpool’s Champions League group campaign has been a mixed bag, especially away from home where they lost to Napoli, Red Star Belgrade and PSG. They have, however, navigated their way out of a tough group with three home wins and are now in the territory in which they flourish, namely the two-legged format with the power Anfield can provide. Liverpool must improve on that poor away form – but their optimism will be rising after reaching the last 16. Andrew Robertson continues to catch the eye for the Reds. The Scotland left-back kept Napoli right-winger Jose Callejon quiet throughout, won possession back for his team more than any other player and constantly offered a threat going forward. Liverpool have progressed to the knockout stages in successive Champions League campaigns for the first time since 2008-09. They are unbeaten in 19 successive European matches at Anfield, winning 14 and drawing five. Their last home defeat in European competition came when they lost to Real Madrid in October 2014. Napoli have not won any of their past seven Champions League away matches, losing five, with their last victory in the competition coming against Benfica in December 2016. Liverpool have kept clean sheets in six of their past eight Champions League games at Anfield, including both of the past two. Mohamed Salah has had a hand in 48 goals in 38 games in all competitions for Liverpool at Anfield (35 goals, 13 assists). Since the start of last season, Liverpool’s James Milner has provided more assists in the Champions League than any other player (9). Another huge game looms for the Reds as they look to maintain their place at the top of the Premier League when arch-rivals Manchester United visit Anfield on Sunday (16:00 GMT). Attention will then turn back to the Champions League on Monday when the last-16 draw is made. ‘Confusion, deflation & uncertainty’ – could Fury deal block golden era? Super Bowl 53 quiz: How well do you know the NFL’s biggest game?